Okinawa Chousei Yakusou Honsha Co., Ltd is working hard to export its three flagship products to Taiwan. After passing an examination for food importations, Okinawa Chousei Yakusou Honsha Co., Ltd (President Seikichi Shimoji, Nanjo City) has received approval from the Taiwanese Government to export its products there. The company will commence exports of its products to the Taiwanese market in earnest from this July. They are aiming at 40 million yen worth of sales in the first year in Taiwan, which follows on from Shanghai in their movement into the international market. The company started business talks with a Taiwanese trading company at an International Food Fair held there in June 2010, and they entered into a contract last August. From there, the company applied for an examination of its products (the components and raw materials) by the Taiwanese authorities and importation was approved in June. 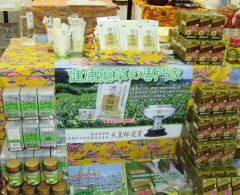 The company will export its three flagship products, which the main ingredients are turmeric, including Ryukyu-Shugo Densetsu (Hard Drinker’s Legend) and Haru ukontsubu which are both health supplements taken before drinking alcohol, and another supplement Odayaka, which is blended with the gymnema sylvestre herb and guava. In future the company hopes to export other products following on from these three flagship products.